Get ready---it's almost time for MPCA's annual Legislative Day that will be held on Wednesday, April 24, 2019, following the MPCA annual board meeting and all-members meeting and dinner on Tuesday, April 23, 2019. Don't miss this opportunity to learn more about the current state legislative landscape, meet with state legislators, and share our policy priorities for 2019. An agenda will be available soon! ***When registering for the Legislative Forum, please check all activities you plan to attend. If you are only attending the pre-forum activities, please email Barb Lincoln at blincoln@mpca.net. Cancellations and refunds must be submitted in writing. Substitutions are accepted in lieu of cancellations. A 10 percent administrative fee is charged for all cancellation and refund requests. No refunds will be given within five business days of the event. Parking ramp is connected to the Radisson Hotel. (Entrance to the Radisson pedway is on the third floor ramp - Click on link to view map of parking. 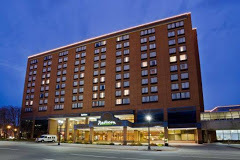 Hotel reservations can be made by calling the Radisson reservations line at 1.800.333.3333 or by visiting www.radisson.com/lansingmi and using the promo code MPCAB9. The Radisson cannot guarantee MPCA's group rate for reservations made after April 9, 2019. Please contact Barb Lincoln, Training and Education Manager, at blincoln@mpca.net or 517.853.1062.